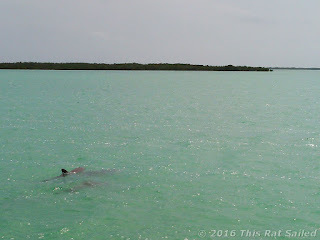 We left our convenience anchorage at Tarpon Basin on Friday (4/22) to check out some of the keys in the nearby section of Everglades National Park. The goal was to see if we could find a spot near Nest key. The water is a bit thin except at the north side of the key so this would only be possible if the winds calmed down and shifted to the south as forecast. Naturally, the forecast was a bit off and we decided to duck in behind Shell key. Panorama of the Shell key anchorage. Before we left Tarpon Basin there was one task I wanted to accomplish. While I have depth sensors on both hulls, I've often wondered how they were calibrated. They have never read depths as deep as I would expect and I figured they were showing readings either from the sensor location or from the bottom of the keels and not from the waterline. Since water depths in the Florida Keys are shallow, it would be good to know exactly what the readings represent. I got out a boat pole and extended it to its full length. I then used it to measure the depth as close to the sensor positions as I could. What I found was that when the depth sensors read 3.8 feet, the boat was sitting in 6 feet of water. So, as I thought, it seems the sensors are reading depth from the bottom of the hull with a bit of safety buffer. Good to know. 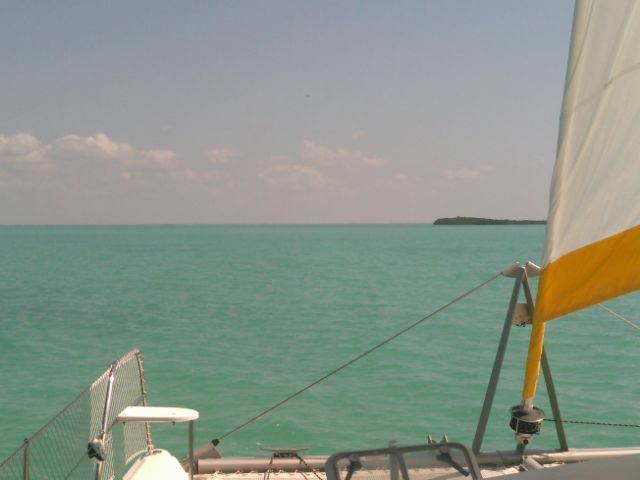 We threw out the hook at the south end of the anchorage behind Shell key in about 5 feet of water. We can just see civilization off our bow on Key Largo over the top of the key. Behind our boat are small uninhabited keys separated from us by turquoise water. The water isn't as clear as I had hoped, I guess the wind is keeping a bit of silt churned up. Except for visits from a few fishing boats and a small pod of dolphins, we've had the anchorage to ourselves. It was a beautiful place to hang out, swim a little, read a little, write a little, and watch the sunset. The next morning we decided to go check out Nest Key. The winds were forecast to clock around to the west and die down. Our current spot didn't offer much protection from the west and we did want to check other areas out. So, after a leisurely breakfast we hauled up the anchor and made the short sail. We apparently forgot it was the weekend until all the small power boats and pontoon boats started zipping by. They were headed to Nest as well. It is one of the few Keys in the park where you can go ashore and apparently the camping spot and beach on the west side is a popular place to congregate on the weekends. I never get tired of sunsets from the boat. We tried to find a place to anchor on the northeast side of the key, but every time we thought we found a Sandy spot, we would discover these light colored round coral heads. Our path around that end of the island probably looked like one of the weekend party goers had a bit too much to drink as we tried to locate a suitable spot. In the end we didn't want to risk damaging any coral and gave up. motored most of this trip. 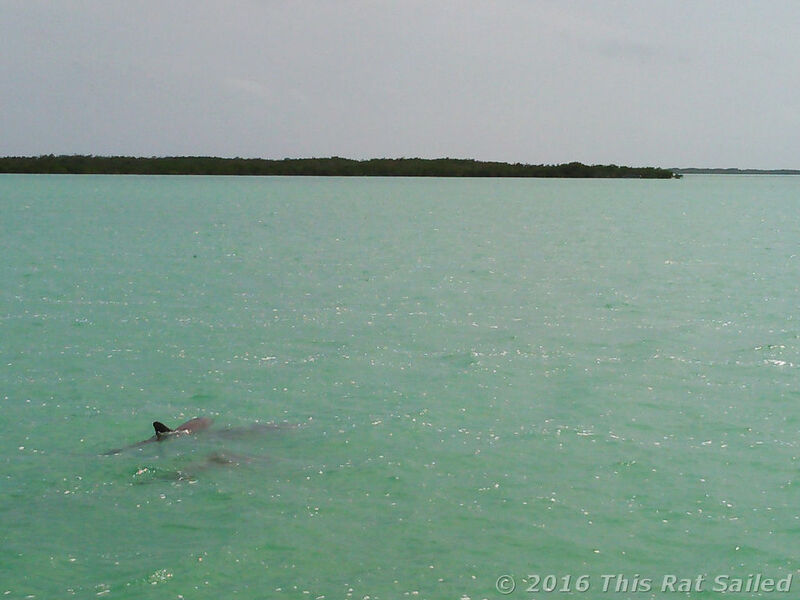 We sailed over to Porjoe key to see if there was a suitable spot there to throw the hook. As we made our way over, we checked the weather again and found the forecast was now for stronger winds from a more northerly direction. We couldn't find a good spot around this small key and ended up anchoring along the east side of Shell key across the key from where we spent the previous night. Winds were around 20 knots as we sat with our bow pointed at the setting sun and our stern pointing at Key Largo in the distance. The next morning we awoke to nearly the same winds as the night before, only coming from the northwest. Guess the calming aspect of the forecast didn't come true. We decided to do a bit more sailing and threw the hook for one last swim east of Shell key before we made our way back to Tarpon Basin to meet up with some fellow Coloradans (who also bought a catamaran and sailed away) for sundowners. Thanks for the invite Ken and Mary! Despite the weekend traffic, it was a nice and relaxing time.